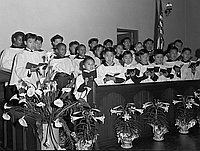 Easter service at St. Mary's Episcopal Church in Los Angeles, California, April 9, 1950. Includes service, choir, departure of congregation and group of young men on steps in front of building with "961" above door. Reverend John M. H. Yamazaki gave sermon at service. Typed on original negative envelope: Easter Service at St. Mary's.